Here is a recap of Week 8 of the 2016 NFL Season with a Tuesday Morning QB & thanks again to AP Sports/ Pro 32 for photos & articles. 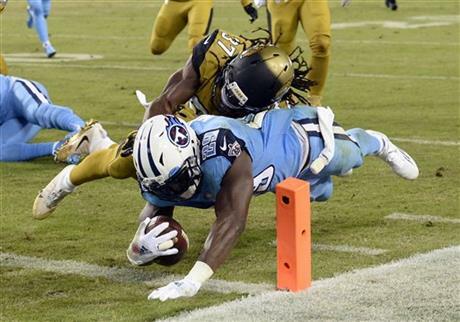 NASHVILLE, Tenn. (AP) — The Tennessee Titans head into the second half of the season believing they’re right in the playoff mix now that they’ve already exceeded their win total from last year. For Gus Bradley and the Jacksonville Jaguars, the future is much less certain. Marcus Mariota threw two touchdown passes and DeMarco Murray rushed for 123 yards and a touchdown Thursday night as the Titans breezed to a 36-22 victory over the Jaguars . The Titans led 27-0 at halftime and scored on six straight possessions during one stretch. The Titans are 4-4 at the halfway point of the season, a major step forward for a franchise that went 2-14 in 2014 and 3-13 last year. They’ve won three of their last four and have a chance to play meaningful games down the stretch if they maintain this momentum. The Jaguars aren’t feeling nearly as good about themselves. A poor performance in a prime-time showcase will turn up the heat on Jaguars coach Gus Bradley, who is in his fourth season and owns a 14-41 record . The Jaguars (2-5) had to score two touchdowns in the last 3 1/2 minutes just to make the final margin respectable. “The first half was inexcusable,” Bradley said. “We didn’t come out to play. I don’t know what the answer is. Do we play with some anxiety? Yeah, I can say I felt like we pressed too much, but some of the plays that weren’t being made had nothing to do with anxiety. MURRAY, HENRY FORMING DYNAMIC DUO: The Titans acquired Murray and drafted 2015 Heisman Trophy winner Derrick Henry because they believed a physical running attack could help them turn things around. Those moves are paying off so far. Murray has rushed for 756 yards and already has exceeded the total from his disappointing 2015 season in Philadelphia. Henry rushed for 60 yards against the Jaguars and scored his first touchdown. Murray hurt a toe late in the first half but returned to the game. MARIOTA AT HOME: The Titans’ quarterback had the best home performance of his career. Mariota had been just 2-8 at home since Tennessee drafted him No. 2 overall out of Oregon in 2015, and he had at least one turnover in each home game this season until Thursday night. Mariota was credited for a fumble on the opening drive for a 12-yard loss, but left guard Brian Schwenke recovered the ball. Mariota’s 148.1 passer rating was the second-highest of his career. MARIOTA LENDS HELPING HAND: Mariota helped the Titans even when he wasn’t throwing or carrying the ball. On Murray’s 14-yard touchdown run in the second quarter, Mariota attempted a downfield block to help clear the path to the end zone. JAGUARS STRUGGLING TO RUN: The Jaguars came in ranked 30th in the NFL running the ball, and their struggles continued Thursday as they ran only 11 times for 48 yards. Bortles ended up rushing for a team-high 22 yards. Chris Ivory had four carries for just 6 yards, and T.J. Yeldon ran three times for 20 yards. BORTLES BOUNCES BACK (OR DOES HE? ): Bradley said earlier this week that he “firmly, firmly” believes in his third-year quarterback. Bortles responded by throwing for 337 yards with three touchdowns, but most of those yards came with the Titans playing prevent defense. In the first half, Bortles was just 8 of 16 for 64 yards. KICKING WOES: It wasn’t only Hopkins ruing his errors. The Bengals’ Mike Nugent had a chance to tie at 10, but his low-trajectory 51-yarder spun wide left. Nugent has often struggled from long range throughout his 12-year career. He has yet to convert a field goal beyond 47 yards this year, and fell to 0-for-3 from 50 yards or more. Nugent then missed his first extra point of the season, wide left following the Bengals’ go-ahead drive of the second half. WATCH THOSE HANDS: Redskins’ star cornerback Josh Norman was called four times for illegal use of hands. It’s a shame for Washington that those hands weren’t as sticky to the ball. Norman dropped two great interception opportunities while jumping routes on short sideline throws to A.J. Green. The first hit him squarely in both hands on the Bengals 39 near the end of the first half, the second was in Redskins territory during the Bengals’ opening drive of the second half. A pick then would have stopped the Bengals from seizing the lead barely a minute later. CHARLOTTE, N.C. (AP) — The Carolina Panthers emerged from the bye week looking a little more like the team that went to the Super Bowl last season rather than an NFC doormat. Jonathan Stewart ran for 95 yards and two touchdowns, Thomas Davis returned a fumble 46 yards for a score and the Panthers snapped a four-game losing streak with a 30-20 victory over the Arizona Cardinals on Sunday. In a game reminiscent of last season’s NFC championship, a 49-15 Carolina victory, the Panthers jumped to a 24-0 lead and kept the pressure on Carson Palmer all day. Carolina, which has struggled to generate a pass rush all season, sacked Palmer eight times — three of those by Star Lotulelei — and forced two turnovers. The Panthers also limited running back David Johnson to 24 yards rushing. Panthers coach Ron Rivera said the win felt like a big weight was lifted from his shoulders. “It is huge because it is one of those things we can build momentum off,” Rivera said. Stewart added touchdown runs of 2 and 1 yards to push the lead to 21-0 against an Arizona defense that hadn’t allowed a touchdown in its previous two games. Forced into a one-dimensional game, Palmer finished 35 of 46 for 363 yards with three touchdowns, two to J.J. Nelson . After losing their last two games on last-second field goals, the Panthers left no doubt about this one. Carolina (2-5) needed a boost to save a sinking season and got one from Davis, their longest-tenured player and emotional leader, on the opening series. Lotulelei sacked Palmer, who attempted to push the ball forward to avoid the sack while in the grasp of the 315-pound defensive tackle. 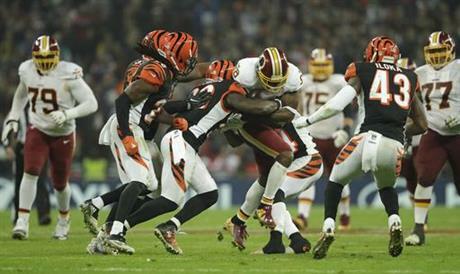 Davis picked up the loose ball and delivered a stiff arm on the way to the first touchdown of his 12-year NFL career. Palmer didn’t see it as a fumble. The Cardinals (3-4-1) battled back within 30-20 and had the ball at the Carolina 36 with 3:18 left. But defensive end Kony Ealy tipped Palmer’s pass and intercepted it to help seal the Carolina win. NEWTON ON THE RUN: Newton said last week he wasn’t afraid to run after being knocked out with a concussion against the Falcons on Oct. 2, and he proved it Sunday. Newton ran six times for 39 yards. 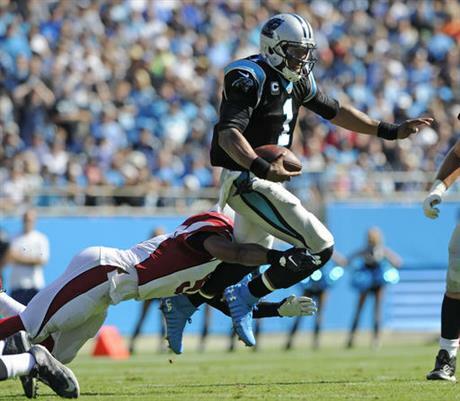 “The offensive line played very physical and we ran the ball extremely well,” Newton said. WHAT BROWN CAN DO FOR YOU: Arizona wide receiver John Brown, who missed last week’s game against Seattle because of leg issues related to a sickle-cell trait, caught a 17-yard touchdown pass from Palmer in the third quarter. CORNERBACK ROTATION: Nickel cornerback Leonard Johnson gave the Carolina defense a big boost in his first game. Johnson, activated from the non-football injury list last week, had eight tackles, one sack and a pass breakup. FRUSTRATION SETS IN: Frustration got the best of Palmer in the third quarter when he was flagged for unsportsmanlike conduct in the third quarter when he argued an illegal hands to the face call against a teammate, resulting in a 15-yard penalty and a second-and-44. Cardinals: Safety Tyrann Mathieu left in the first half with a shoulder injury and did not return. Left tackle Jared Veldheer departed in the fourth quarter with an arm injury. Panthers: Two-time All-Pro center Ryan Kalil (right shoulder) and did not return. UP NEXT: The Panthers travel to Los Angeles next Sunday. The Cardinals have a bye. HOUSTON (AP) — Despite mounting criticism in recent weeks, Brock Osweiler continues to look pretty comfortable in Houston. 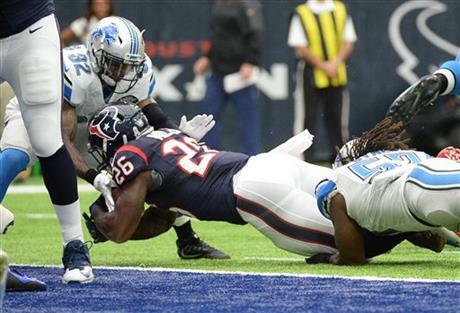 Osweiler bounced back from an ugly performance by throwing for 186 yards and a touchdown to help the Texans remain perfect at home this season with a 20-13 win over the Detroit Lions on Sunday. The Texans (5-3) have lost all of their road games, including a 27-9 loss to Denver on Monday. Osweiler has struggled in his first season with the Texans, but has been better at home where he’s thrown eight of his nine touchdown passes. On Sunday, he gave the Texans a 7-0 lead on a 6-yard touchdown pass to C.J. Fiedorowicz in the second quarter. The Texans made it 14-0 when Lamar Miller bulled his way into the end zone from a yard out later in the quarter. That score was set up when DeAndre Hopkins used one hand to make a 12-yard reception. Osweiler believes he’s starting to find chemistry with his star receiver. “Every time I break the huddle, I’m looking to see where he’s at … trying to see if I can get him the football,” he said. Hopkins finished with four receptions for 44 yards. The Lions (4-4) cut the lead to seven when Theo Riddick connected with Matthew Stafford on a 1-yard touchdown reception early in the fourth quarter. Houston added a field goal after that before a 34-yard field goal by Matt Prater got Detroit back within a score. But Houston recovered an onside kick and ran out the clock to secure the victory. Stafford threw for 240 yards and a touchdown for Detroit, which had a three-game winning streak snapped as the Lions were unable to continue a string of late-game comebacks. INJURIES: The Lions were without top cornerback Darius Slay, who missed the game because of a hamstring injury. Houston receiver Jaelen Strong injured his ankle in the second quarter and didn’t return. Texans nose tackle Vince Wilfork didn’t return after injuring his groin in the third quarter and receiver Will Fuller left the game in the fourth quarter with a leg injury. O’BRIEN’S OUTBURST: Houston coach Bill O’Brien was seen yelling at special teams coach Larry Izzo after the Texans had just 10 men on the field for the opening kickoff of the second half. O’Brien got in Izzo’s face and yelled for several seconds before being pushed away by another member of the staff. He turned around for a second and started to walk away before whipping back around and screaming at him for several more seconds. But O’Brien denied the incident. Then he was asked about being pushed away by a staff member. A second follow-up yielded perhaps the most telling answer of the exchange. CLOWNEY’S CONTRIBUTIONS: Houston defensive end Jadeveon Clowney, who was the top overall pick in the 2014 draft, sacked Stafford for a 9-yard loss to give him three sacks this season. It was his ninth tackle for a loss this season, which is a career high. Lions: Detroit visits Minnesota on Sunday. Texans: Houston is off next week before visiting the Jaguars on Nov. 13. 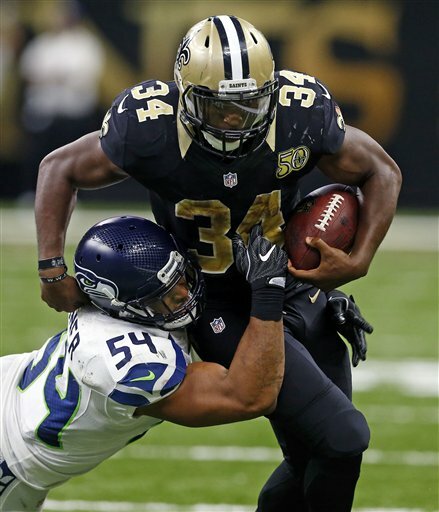 NEW ORLEANS (AP) — Sean Payton had a surprise in store for a Seattle defense that thrives on harassing quarterbacks and physically intimidating receivers. The Saints coach dialed back New Orleans’ prolific passing game and challenged his running backs and offensive line to deliver as much punishment to Seahawks defenders as they could. Drew Brees wound up well short of his typical passing numbers in the Superdome — 265 yards and one touchdown — but the Saints (3-4) pulled out a 25-20 victory they sorely needed to improve their prospects for climbing back into the NFC playoff picture. The Saints rushed 35 times and passed 35 times — certainly not the M.O. for a team that entered the game with a second-ranked passing offense and 28th-ranked running game. But it was effective. New Orleans gained 123 yards on the ground with Tim Hightower gaining 102, making him the first Saint this season to rush for 100. New Orleans also kept possession for 36:12 to Seattle’s 23:48. MINI SLUMP: Seattle has gone two straight games without a win, having tied Arizona last week, but the Seahawks hardly seem concerned. MISLEADING STATS: While the Saints held numerous statistical advantages in several categories, big plays on both sides of the ball helped Seattle lead 14-13 at halftime and keep it close throughout. Seattle defensive end Cliff Avril forced Mark Ingram’s fumble in the first quarter. It popped straight to safety Earl Thomas, who sprinted into the open field for a 34-yard touchdown. A trick play set up Seattle’s second score. Wilson threw a backward screen to his left to receiver Tanner McEvoy, who then threw deep back across the field for a 43-yard completion to running back C.J. Prosise to the Saints 2. That set up Christine Michael’s TD run, making it 14-3. Seattle’s defense also forced a field goal in the third quarter after the Saints had a first-and-goal on the 1 and thwarted a Saints 2-point conversion attempt after Cooks’ TD. BENCHED: Ingram was benched after his fumble on this third carry of the game. It was his second fumble in two weeks while trying to fight for extra yards after contact. A week earlier, Ingram’s fumble inside the Kansas City 10 contributed to a six-point loss. GRAHAM’S RETURN: Jimmy Graham was silent about his return to the place where his NFL career started, avoiding media all week. He had a relatively quiet game as well, finishing with three catches for 34 yards. Graham did speak to media after the game, walking from the locker room to the stadium exit wearing headphones and ignoring several reporters’ questions. BREES AT HOME: Brees now has a TD pass in 58 consecutive home games, extending his NFL-record streak. UP NEXT: Seattle hosts Buffalo in the Week 9 Monday night game, while the Saints travel to meet San Francisco next Sunday. INDIANAPOLIS (AP) — Indianapolis Colts coach Chuck Pagano looked as if he was ready to seethe Sunday night. He refused the temptation. A few more games like this and perhaps Pagano will lose his cool. For now, he must focus on finding solutions to the Colts’ myriad of ailments. “Instead of going in there and throwing a tantrum and all that stuff, that isn’t going to fix what needs to get fixed, it’s obvious,” Pagano said after the 30-14 loss to Kansas City. The problems have been constant throughout the first half of the season. After two weeks of better starts, the Colts reverted to their old form and fell into an early 10-point deficit — a big enough deficit that Andrew Luck and the sluggish offense couldn’t dig them out of it. The Colts’ defense couldn’t get off the field. Indy (3-5) had five more penalties, pushing their total to 63. The Chiefs — even with a backup quarterback and only one healthy running back — easily overpowered the beleaguered Colts. And if Indy doesn’t fix this soon, any shot of making the playoffs could soon fade, too. The Chiefs’ big concern coming out of their third consecutive win is that they aren’t sure who will play quarterback or running back next week against Jacksonville. Alex Smith left twice with head injuries, the second diagnosed as a concussion. In between the departures, he still managed to throw a TD pass. Backup Nick Foles played well in relief, throwing two TD passes and leading the Chiefs on four scoring drives. Spencer Ware, who started in place of the injured Jamaal Charles didn’t play in the second half after also being diagnosed with a concussion. But at least they have some momentum. NOT-SO SPECIAL: The Colts could argue they have the two best kickers in the league — Adam Vinatieri and punter Pat McAfee. Unfortunately, the coverage teams aren’t so special. Chiefs punt returner Tyreek Hill ran around the Colts’ coverage three different times, averaging 19.0 yards on those returns. Indy, meanwhile, fumbled two punts — one of which was erased by a penalty. 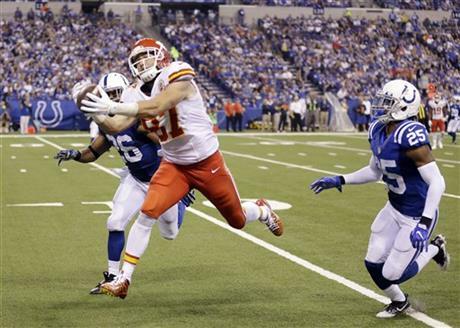 TRAVIS IS TROUBLE: Travis Kelce keeps getting better and better, and he was spectacular in the first half Sunday. He caught six passes for 96 yards and a touchdown and finished with season highs of seven receptions for 101 yards. Whoever the quarterback is next week, they need to keep throwing Kelce’s way. LOSING GROUND: Just when it appeared Indy’s offensive line was starting to make progress, it took a step back against the Chiefs by allowing six sacks and more hits on Luck. That wasn’t the only problem. Indy rushed 21 times for 105 yards, 60 of which came on Luck’s scrambles. The Colts have gone 28 consecutive home games without a 100-yard rusher. DOMINANT DEFENSE: Kansas City has played two of the top eight scoring offenses in back-to-back weeks and shut down both. Last week, they beat New Orleans 27-21 at home. This week, they rolled on the road. And with Jacksonville, Carolina and Tampa Bay coming up over the next three weeks, the Chiefs’ dominance could continue. ORCHARD PARK, N.Y. (AP) — Patriots quarterback Tom Brady asserted his on-field ownership of the Buffalo Bills again Sunday, matching an NFL record in beating them for the 26th time. Brady went 22 of 33 for 315 yards and threw four touchdowns in leading New England to a 41-25 win. He improved to 26-3 against Buffalo , matching a record set by Brett Favre, who went 26-9 against Detroit. Best of all, Brady’s performance had Bills fans heading for the exits early in the fourth quarter, what whatever Patriots fans remained as the clock wound down. The Patriots (7-1) have won four straight since Brady returned after opening the season serving the NFL’s four-game “Deflategate” suspension. His absence included New England’s only blemish, a 16-0 home loss to Buffalo on Oct. 2, the first time the Patriots were shut out at home since 1993. And don’t think that loss didn’t still sting. 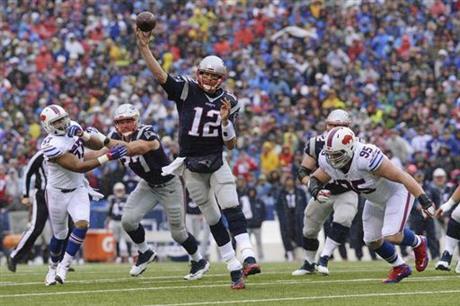 After a Bills field goal, Brady threw touchdowns passes on his first two drives. They included a 53-yarder to former Bills receiver Chris Hogan , who beat cornerback Stephon Gilmore up the left sideline. The Patriots then broke the game open by scoring 27 points over five consecutive possessions in a surge that began with Gronkowski scoring his 69th career touchdown to break a franchise record previously held by Stanley Morgan. The Bills (4-4) sputtered minus their offensive top threat, running back LeSean McCoy, who has a hamstring injury. And their defense was unable to keep the Patriots in check despite star defensive tackle Marcell Dareus making his season debut. Dareus missed the past three games because a hamstring injury, and missed the start of the season serving a four-game suspension for violating the NFL’s substance abuse policy. The Patriots punted just three times and converted nine of 13 third-down opportunities. Backup running back Mike Gillislee scored on a 3-yard run and Taylor scrambled for a 26-yard touchdown on fourth down in the third quarter. Jonathan Williams scored on a 1-yard run with 30 seconds left. Danny Amendola and Julian Edelman also caught touchdown passes, while LeGarrette Blount scored on a 1-yard run. For Brady, it was his first four-TD outing since a 36-7 win over Miami last October. It was the most he’s had on the road since throwing four in a 37-22 win at Orchard Park on Oct. 12, 2014. Of his 20 regular-season games with four touchdowns passing or more, six have been against Buffalo. Gronkowski, who grew up in Buffalo, actually set two franchise records with his 53-yard touchdown catch . It was his 69th touchdown and 68th TD receiving, moving him one ahead of Morgan in both categories. After spiking the ball, Gronkowski spun and took a bow. He said he bowed in tribute to his mother, Diane, who met with Gronkowski at the team hotel on Saturday and told him how proud she would be for him to break the record. The Bills had five sacks, upping their season total to 26 — five more than they managed all last season. Veteran defensive tackle Kyle Williams had one, his 38th, moving into eighth on the franchise list, one ahead of Sherman White. Patriots: Amendola’s 73-yard kickoff return to open the second half led to Brady’s 12-yard TD pass to Edelman to put New England up 31-10. Bills: Bills punter Colton Schmidt bumbled his drop while facing fourth-and-15 at his own 20. He quickly scooped it up and broke up the right sideline for a 16-yard gain. Buffalo eventually went on to score on Taylor’s 26-yard run to cut the Patriots lead to 31-17 midway through the third quarter. Bills: LB Lorenzo Alexander did not return after hurting one of his hamstrings during a punt return in the second quarter. Receiver Brandon Tate (concussion protocol) did not return after being tackled by Devin McCourty in the third quarter. RB Reggie Bush hurt his groin. A week after openly criticizing team management for losing faith in himwhen it benched him in favor of Geno Smith, Fitzpatrick overcame a nightmarish first half to throw for 222 yards and a score. Browns: host the Dallas Cowboys. Cleveland hasn’t beaten the Cowboys at home since 1988. TAMPA, Fla. (AP) — Derek Carr kept throwing touchdowns and the officials kept throwing flags as both set records as the Oakland Raiders defeated Tampa Bay 30-24 in overtime on Sunday. Carr finished with a franchise-record 513 yards passing — completing 40 of 59 passes without an interception. The Raiders (6-2) also overcame a NFL-record 23 penalties for 200 yards to remain unbeaten on the road. Carr threw to Seth Roberts for the winning score with under two minutes to go in overtime. He had tied the game a scoring throw to Mychal Rivera with 1:38 remaining in regulation. “It was an awesome performance. I’ve seen some good ones. I think we’ll continue to see good ones from him,” Raiders coach Jack Del Rio said. Carr said when he was told he had thrown for more yards in a game than any other quarterback in team history, he nearly cried. Carr broke a 52-year-old record set by Cotton Davidson. 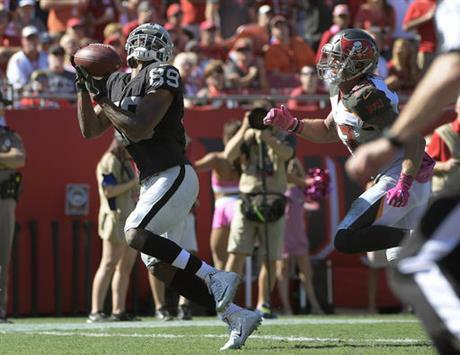 Offensive tackle and ex-Buc Donald Penn and Amari Cooper also caught TD passes, with Cooper winding up with 12 receptions for 173 yards and Michael Crabtree adding eight catches for 108 yards. Oakland amassed 626 yards total offense and dominated time of possession by more than 15 minutes against an overworked Tampa Bay defense that was on the field 85 plays. Jameis Winston threw for 180 yards and two touchdowns for the Bucs (3-4), who took a 24-17 lead on a 1-yard run by Jacquizz Rodgers and 2-point conversion. Raiders kicker Sebastian Janikowski missed a 50-yard field goal as time expired to send it into overtime. Janikowski misfired again from 52 yards on Oakland’s first possession of the extra period. On the winning play, Carr hit Roberts into the middle of the field on fourth-and-4, Tampa Bay defenders lunged and missed the tackle at the 30, and the receiver sped into the end zone. The Raiders, who beat Jacksonville last week and remained in Florida to prepare for the Bucs, are 5-0 on the road for the first time since 1977. Tampa Bay, which had a two-game winning streak stopped, fell to 0-3 at home. FILLING IN: With RB Doug Martin still sidelined by a hamstring injury, Rodgers made his third start for Tampa Bay and rushed for 69 yards on 19 carries against the league’s 32nd-ranked defense. Rodgers topped 100 yards each of the previous two games , keying victories over Carolina and San Francisco. 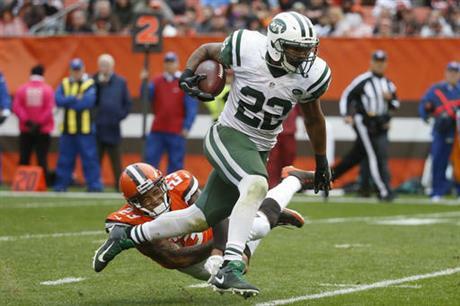 Martin, the league’s second-leading rusher a year ago, has been out since getting hurt at Arizona Week Two. FLAGS, FLAGS AND MORE FLAGS: The Raiders hurt themselves repeatedly with penalties, including a delay of game on first and goal from the Tampa Bay and an offensive pass interference call against WR Michael Crabtree that nullified a touchdown. They wound up settling for Sebastian Janikowski’s 31-yard field goal that trimmed a second-quarter deficit to 10-3. Oakland was penalized four times, twice on third-and-1 for lining up with 12 men on defense, during the fourth-quarter drive Winston used to put Tampa Bay up 24-17. INJURIES: The Raiders lost CB Sean Smith with a shoulder injury on the second play of the game. The Bucs said Rodgers left the game late with a foot injury. UP NEXT: The Raiders return home from their extended stay in Florida to face the Denver Broncos. The Bucs have a short week, continuing a three-game homestand against the Atlanta Falcons on Thursday night. 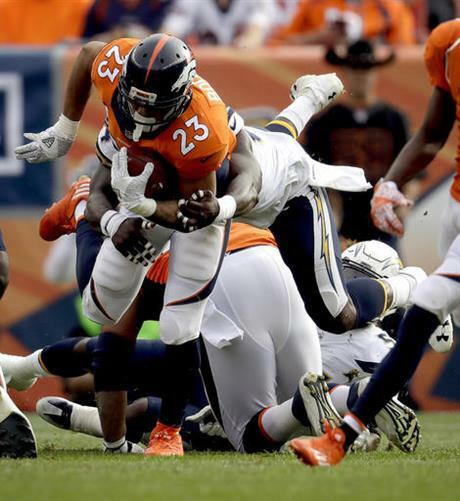 DENVER (AP) — The Denver Broncos took turns picking off and pummeling Philip Rivers in a 27-19 win over the San Diego Chargers on Sunday. But defensive coordinator Wade Phillips was taken to a hospital after getting knocked down during Brady Roby’s 51-yard touchdown return in the second quarter, tempering their enthusiasm. San Diego running back Melvin Gordon was blocked into the 69-year-old assistant, who was strapped to a backboard and carted off the field. The Broncos said Phillips was alert and had movement in his arms and legs when he arrived at the hospital via ambulance. With linebackers coach Reggie Herring taking over Denver’s defensive calls for Phillips, the Broncos (6-2) had a goal-line stand in the closing minutes and picked off Rivers twice more in the second half. They only turned one of those takeaways into points, however, and that allowed the hard-luck Chargers (3-5) to stay in it until the end, forcing Denver to make two stands in the closing minutes. Safety Darian Stewart’s takeaway gave Denver the ball at the San Diego 10, and Devontae Booker’s 3-yard TD run made it 17-7. Safety T.J. Ward’s interception set up his offense at the Chargers 7. But Booker, making his first career start after C.J. Anderson (knee) went on IR, fumbled at the San Diego 2 and linebacker Jatavis Brown recovered. The Chargers capitalized with a 98-yard touchdown drive that ended with Travis Benjamin’s one-handed TD grab. Shaq Barrett blocked Josh Lambo’s extra point, keeping the score 17-13. Juwan Thompson, promoted from the practice squad Saturday, scored from the 1 to make it 24-13. But the Chargers got into the defensive act themselves when cornerback Casey Hayward returned a tipped pass from Trevor Siemian to Jordan Norwood 24 yards for a touchdown that made it 24-19. Antonio Gates’ illegal pick negated a 2-point conversion catch by Gordon, and Jared Crick deflected Rivers’ do-over pass, keeping it a five-point game. The Chargers reached the Denver 2 with three minutes remaining but threw four consecutive incompletions without handing off to Gordon, who had 111 yards on 23 carries. San Diego’s last gasp ended at midfield. Roby, starting in place of Pro Bowl cornerback Aqib Talib (lower back), gave Denver a 10-7 lead with a 51-yard pick-6 in the second quarter. Rivers’ pass went off receiver Tyrell Williams’ hands and Roby spun around and plucked the ball out of the air. He quickly found the sideline, slipped past tackle Joe Barksdale and outraced Rivers into the end zone. DIDN’T COUNT: Roby’s pick-6 came a few minutes after DeMarcus Ware’s strip-sack was overturned on review even though it appeared he had his hand on the football as Rivers was about to release it. Linebacker Corey Nelson, making his first career start in place of Brandon Marshall (hamstring), scooped up the ball and returned it to the San Diego 22. Ware was making his first start since breaking his right forearm in Week 2. DAWDLING DENVER : A week after holding Houston to three-and-outs on its first two drives, Denver’s dawdling defense again surrendered a touchdown on its first series. That makes six times in eight games the Broncos have allowed a TD on an opponent’s first drive. STREAK CONTINUES: After snapping a 10-game AFC West skid with a 21-13 win over Denver 17 days earlier, the Chargers lost for the eighth straight time on the road in the division. ATLANTA (AP) — The Atlanta Falcons found themselves in another tight game. This time, they came through with the winning play. After two excruciating losses, the Falcons rallied for a 33-32 victory over the Green Bay Packers when Matt Ryan threw an 11-yard touchdown pass to Mohamed Sanu with 31 seconds remaining Sunday. 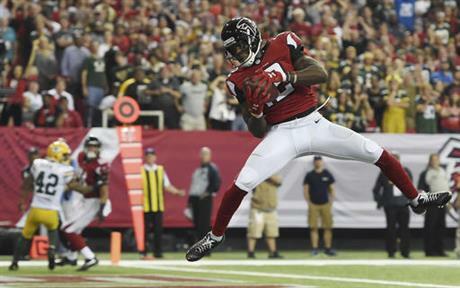 With Julio Jones shut down in the second half, Ryan turned to Sanu to bail out Atlanta (5-3). He caught five passes for 50 yards on the final possession, the last of them a touchdown pass in the back of the end zone after he got matched against linebacker Jake Ryan. The Green Bay player didn’t have a chance. Sanu raced past him and hauled in the pass right in front of the goalposts, the ball easily clearing Ryan’s outstretched hands. The Falcons were coming off a 26-24 loss at Seattle and a 33-30 overtime setback to San Diego in which they squandered a 17-point lead at home. Given what happened a year ago — Atlanta started the season 6-1, then lost six in a row and missed the playoffs — it was imperative to turn things around against the Packers. It didn’t look good when Aaron Rodgers threw his fourth touchdown pass, putting the Packers ahead with 3:58 remaining. Sanu had nine catches for 84 yards, both season highs in his first year with the Falcons. Atlanta needed every one of them, since Jones was held to three catches for 29 yards and targeted only once in the second half — a dropped pass on the final possession. But Jones helped Sanu get open on the winning play, drawing two defenders when they lined up on the same side of the field. Ryan was 28 of 35 for 288 yards and three touchdowns. Rodgers threw for 246 yards, teaming up with a bunch of unknown receivers as the banged-up Packers played without six starters. Linebacker Clay Matthews and receiver Randall Cobb were among those who couldn’t go because of hamstring injuries. Three Green Bay receivers — Geronimo Allison, Trevor Davis and Jeff Janis — got their first career touchdown. Allison, in fact, had just been promoted from the practice squad and never caught a pass in an NFL game. Ditto for Davis, a rookie who had mainly been used as a returner. “That’s our job, to go out and make plays regardless of who’s in there,” Allison said. The Packers took a 32-26 lead after the Falcons were caught with too many men on the field, giving Green Bay a first down rather than having to go for a fourth-and-1. Rodgers went to Janis for a 7-yard touchdown with 3:58 remaining, followed by a 2-point conversion. It wasn’t enough. Sanu’s touchdown tied the game, and Matt Bryant booted through the winning extra point. Bryant had already become the Falcons career leading scorer, passing Morten Andersen, with a PAT after Atlanta’s first TD. Adrian Clayborn had the first multi-sack game of his six-year NFL career, bringing down Rodgers twice in the second half. Vic Beasley Jr. also had a sack, giving him 6 1-2 over the last four games and 7 1-2 for the season. Rodgers was also Green Bay’s leading rusher with a career-high 60 yards on six carries. He broke his previous best of 57 yards in 2012, and posted the highest rushing total by a Packers quarterback since Don Majkowski’s 88-yard effort in 1990. The Falcons lost tight end Jacob Tamme to a right shoulder injury on the opening possession. Tamme took a hit at the end of a 13-yard reception and left the field holding his right arm. Packers: Return home next Sunday to face the Indianapolis Colts (3-5), in what will be the only game played in Green Bay during the month of November. After that, it’s three straight on the road. Falcons: Have only three days to prepare for a Thursday night game at Tampa Bay (3-4), which is coming off a 30-24 overtime loss to Oakland. This will be the second meeting between the NFC South rivals; the Buccaneers opened the season with a 31-24 victory in Atlanta. ARLINGTON, Texas (AP) — Dak Prescott threw a 5-yard touchdown pass to Jason Witten in overtime to give the Dallas Cowboys their sixth straight victory, 29-23 over the Philadelphia Eagles on Sunday night. Prescott won the rookie quarterback duel with Carson Wentz, rallying the Cowboys with a late tying pass to Dez Bryant. Dallas (6-1) overcame a 10-point deficit in the fourth quarter to take a two-game division lead. The 23-year-old Prescott recovered from a shaky start, finishing 19 of 39 for 287 yards with two scores and an end zone interception that cost the Cowboys points late in the first half. Wentz had the Eagles (4-3) in position for a win with another efficient performance. But he couldn’t move Philadelphia late in regulation with the game tied. The Eagles never got the ball in overtime after Prescott led the 75-yard scoring drive. 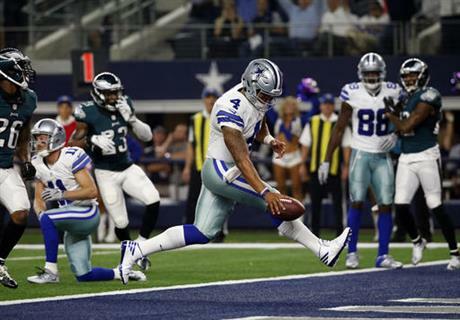 On the winning play, Prescott started to his right before spinning back to his left and finding a wide-open Witten, who broke Ed “Too Tall” Jones’ franchise record with his 204th start. Bryant had four catches for 113 yards, including a 53-yarder to set up the first Dallas touchdown, in the 2014 All-Pro’s return after missing three games with a hairline fracture in his right knee. Ezekiel Elliott’s NFL rookie record of four straight games with at least 130 yards rushing end, but the NFL’s rushing leader played a big part on the winning drive with 18 yards rushing and a 10-yard catch that set up Witten’s score. He finished with 96 yards on 22 carries. Prescott’s TD pass to Witten tied Troy Aikman’s rookie franchise record of nine scoring passes after Wentz broke Donovan McNabb’s rookie mark of eight from 1999 with his ninth of the season, a 5-yarder to Jordan Matthews that put Philadelphia up 20-10 in the third quarter. Darren Sproles had a season-high 86 yards rushing on 15 carries for the Eagles. Matthews had 11 catches for 65 yards. NOT SO SPECIAL: The Cowboys had a rough first quarter on special teams. Lucky Whitehead fumbled the opening kickoff but recovered it. The Eagles later got the ball back after punting when Dallas was called for too many men on the field. Then the Cowboys were called for running into Sturgis, although replays showed a pretty good acting job and the penalty was declined because it wasn’t a personal foul and Sturgis made the 30-yarder. INJURIES: Eagles OL Allen Barbre left in the first half with a hamstring injury and didn’t return. … Cowboys S Barry Church left with an arm injury in the second half and didn’t return. … Cowboys CB Morris Claiborne left with a groin injury late in the fourth quarter. CHICAGO (AP) — Jay Cutler threw for 252 yards and a touchdown after missing five games with a thumb injury, rookie Jordan Howard ran for a career-high 153 yards and a TD, and the Chicago Bears stunned the Minnesota Vikings 20-10 on Monday night. The Bears (2-6) sacked Sam Bradford five times while handing the NFC North-leading Vikings (5-2) their second straight loss. Cutler was on target in his return from a sprained right thumb. Howard easily surpassed his previous high of 118 yards. Alshon Jeffery got his first touchdown reception of the season, and Chicago outgained Minnesota 403 yards to 258. Cutler had not played since he exited against Philadelphia in the second game of the season. But with his future up in the air after coach John Fox wavered in his commitment to him as the starter, he made a triumphant return. Howard, a fifth-round draft pick, broke off a 69-yard run to the 13 on Chicago’s first possession. It was the longest rushing play for the Bears since Kahlil Bell’s 72-yarder against Philadelphia on Nov. 22, 2009. But instead of a touchdown, the Bears got a field goal from Connor Barth. They got another field goal early in the second after Xavier Rhodes broke up a pass to Jeffery in the end zone on third down at the 10. Chicago finally broke through midway through the second quarter when Howard scored on a 2-yard run to make it 13-0. The Vikings drove to the Bears’ 2 in the final minute of the half. But Akiem Hicks hit Bradford for a 10-yard sack on third down, leading to a 30-yard field goal by Blair Walsh. Head linesman Ed Walker was taken from the field on a cart after he slipped on the Soldier Field grass in the first quarter. 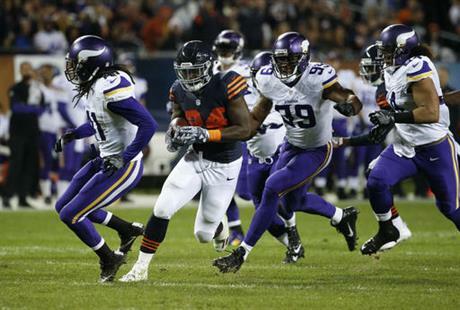 Walker was injured running down the Vikings’ sideline as the Bears punted. His legs bucked, and he was tended to for several minutes by medical personnel before being placed on the cart. Vikings backup receiver and Chicago native Laquon Treadwell made it clear who he’s rooting for in the World Series. He was wearing cleats showing an image of the Chicago Tribune with the headline “Cubs Win!” before the game. Vikings: G Alex Boone was being evaluated for a concussion. … CB Captain Munnerlyn hurt his foot. … SS Andrew Sendejo (ankle) sat out and Jayron Kearse started in his place. Bears: The Bears held out RG Kyle Long (strained triceps) and LG Josh Sitton (ankle). Ted Larsen started at right guard and Eric Kush at left guard. Vikings: Face division rival Detroit for the first time this season when they host the Lions on Sunday. Bears: Have a bye before visiting Tampa Bay on Nov. 13.